Thank you. Thank you to every veteran past and present. Thank you for your service, for your sacrifice, for your honor. You are what is very best in us. On December 7th, 1941 you were bruised and battered, but you stood your ground. You straightened your shoulders and came out fighting. You became legends. On this December 7th, let's remember who we are. Let's remember what our warriors have fought so valiantly to protect. As we reflect on the Second World War, take a moment to remember what we fought against. Only when we remember can we secure our future from the same fate. Remember. NOTE: It is rather ironic that my calendar makes note of Ramadan, Kwanza and Human Rights Day but mentions nothing of Pearl Harbor Day. I love that pic of the B-29 that dropped the bomb on Horishima. After the nuke was used, we were hoping for no more Pearl Harbour's. On the politicaly correct calender thing, Zombie Tools out of Missoula, Montana has a wonderful zombie calender for 2012. It is a bit gory and the site has a few four letter words in it, but they have the nicest cutting blades, swords, and machetes on the internet. American, hand made cutting tools. They are a bit pricey, but they are hand made. My Ronald Reagan calendar only mentions Pearl Harbor Day. Gotta love that. My calendar says "Pearl Harbor Day"(U.S). 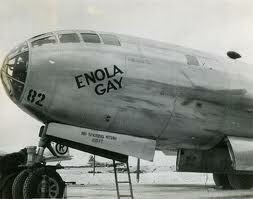 I haven't seen the Enola Gay, but I have seen Bockscar, the one that dropped the bomb on Nagasaki,as well as full-scale models of both bombs-I live a couple hours from the Air Force Museum in Dayton, and I go once a year or so. I wonder if nuclear energy would have such a bad name if the first public demonstration of it had been a power plant instead of a bomb? Maybe World War 2 would have been different if nuclear power plants appeared in the late 1930s(technically possible, but the Depression was going on..)? Nuclear plants would imply bombs. Do you really want to attack someone who can lay waste to your country? Zombie Tools! I gotta check that out..
My cousin was in Tinian Island when the Enola Gay was loaded with "big boy" and took off for Hiroshima. He has told me that everyone on the island were told that it was carrying a large new camera to take pictures of targets. They dug a hole in the runway and placed the bomb in it and put the plane's bay over this so they could get the huge bomb in place. He told me that even after the bomb was dropped no one on the Island was informed about what had just taken place. Today my best friend's wife is Japanese. Her mother was a Hiroshima survivor with burns and physical scars from that day. Two very different things to think about that same event. I don't have regrets for what our government did as I had uncles and cousins in the Pacific theater and if Japan had been invaded it is estimated that as many as a million allied soldiers would die and over 4 million japanese soldiers and civilians would die as well. All things considered the bombs saved lives. Another fact not often brought up is that Russia was preparing to invade Western Japan and would be ready to do this about 6 weeks after we dropped the bomb. Had we not dropped the bomb Japan would unduobetedly become a split country like Germany was with who knows how many deaths and how much sufferring from that. I honored Pearl Harbor Day by reading a little about the events of that day and the treachery in our own government. Those young men were sacrificed with the full knowledge of the US govt. Reminds me of today, sadly. You like nuclear weapons so much, maybe somebody like Kim Jong Il can arrange to drop one on you. I mean, he doesn't like our style of government, and our govt is busy making wars all over the damn place, so it might not be a bad idea if we had a taste of the medicine we enjoy dosing others with. No where do I recall mentioning that I liked nuclear weapons - or war for that matter. Agree or don't agree with our government - but never disparage the men and women who serve us so valiantly. We were not the aggressors in WWII. We did not start the fight, but we did finish it. I will not apologize for making a stand against evil. I applaud your stand against evil, and your support for our military. As the Apostle Paul stated in Romans 12:9....."Hate what is evil;cling to what is good." And I will cling to the memory of honor and duty that our veterans have exemplified since 1776. We have nothing to be ashamed of. "...but never disparage the men and women who serve us so valiantly." I certainly do not. However, those with eyes to see must realize that the US soldier does not serve the general American body politic. I will certainly disparage men and women that dis-service America. If American soldiers participating in unlawful wars is not worthy of stern criticism then what is? A follower of christ? Of US law? I think not. It is clear Anon wants a fight and is willing to smear good men and women to get it. I support our military and know the sacrifice they make. The politics are managed by the politicians and the fact that you disagree with the politics seems to blind you to everything. It is no suprise that you like Kim Jong Il.